Of all the real estate markets within MENA few have been worse affected than Dubai. Two recent reports released by CB Richard Ellis and Colliers International promised only the grimmest of statistics with the market placed at a Y-o-Y decline of 48% between Q2 2008 and Q2 2009, with a decline in the overall House Price Index of 9% between Q1 2009 and Q2 2009. The news from the ground was no better. 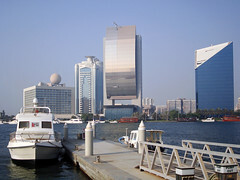 Harbour Real Estate said that their profits have dipped 38% during the period consisting of the second half of 2008 and the first half of 2009. “Our revenues dropped approximately 40 per cent over the past 12 months. Sales volumes have dropped approximately 70 per cent,” said Mohanad Alwadiya, Managing Director of Harbour Real Estate. Even Dubai Holding, part of the business empire of the Emirate’s ruler Mohammed bin Rashid Al Maktoum, is struggling. In July, Moody’s Investors Service downgraded its rating for Dubai Holding Commercial Operations Group to A3 from A2 and placed it on review for a possible further downgrade citing ongoing concerns over the Emirate’s real estate sector. But things could be looking up. A report from international property consultants Jones Lang LaSalle shows that the volume of transactions has remained consistent in the first half of 2009 compared with a 58% fall between the second quarter of 2008 and the same period in 2009. The report also pointed to a narrowing gap between asking and achieved prices, indicating that vendors are becoming more realistic in terms of the price they are asking, and buyers are prepared to invest. However, very few share such a positive outlook for the future. In comparison to the situation in Dubai Saudi Arabia is flying high, despite taking a slight knock in the market. Residential property prices have dropped about 20 per cent in Riyadh, the capital, and 15 per cent in the commercial centre of Jeddah, while rental prices have dipped about 5 percent according to Colliers International. However, there is no question of distorted figures here – demand is most certainly outstripping supply. “It’s a very different market from the rest of the Gulf countries,” says Ahmad Badr, a real estate analyst at Credit Suisse. “There is genuine underlying demand, and not just investment demand, which has minimised the effects of the financial crisis. The market in general is holding up.” The country is under extreme pressure to provide further housing in order to satisfy the number of people expecting to enter the residential market. This means it will have to build about 158,000 housing units every year between 2010 and 2020 – requiring an annual investment of SR79bn ($21bn), according to National Commercial Bank (NCB), one of the largest Saudi lenders. The lack of residential property is partially due to the scarcity and cost of suitable land. Wealthy merchant families have generally preferred to buy up undeveloped land in and around the big cities, and make money trading rather than developing it. Mindful of the social problems posed by too little housing and a dearth of jobs, the government has been spurred to take bold steps. Emaar has already started work on the vast, $27bn King Abdullah Economic City (KAEC) by the Red Sea, north of Jeddah, only one of four “economic cities’ being proposed. Both markets, then, are facing their own challenges. However, while there is no question of Saudi Arabia muddling along in order to satisfy demand, Dubai’s future is potentially far less stable and the question of if and when the market perks up is still hanging heavily in the air.